Willie got off to a precarious start in life. She and her twin Winnie were born on February 12, 1906, in Saratoga, Texas--very early and very small. They were not in incubators in a hospital, but in a farmhouse tended by their paternal grandmother, aunts, and neighbors. Willie was the smaller and weaker of the two. Her parents, Nathan Pinckney (Pink) Daniel and Clyde Bettie Solomon were expecting one baby and had picked out the name of Winnie. After the birth everyone was so busy taking care of the mother and the babies, there was not time to choose a second name. Finally the doctor said that he had never had a baby named after him, and that is how she became Willie with no middle name. The situation was so serious that a kind neighbor made teacup-sized caps for them to be buried in if needed. Toddy delivered by a dropper every two hours kept their hearts stimulated. Amazingly, both lived. Pink worked building derricks for the oil wells being drilled around Sour Lake. A piece of falling equipment hit him on the head, paralyzing him, in 1907. He died on February 12, 1908, the twins second birthday. After his death, Clyde and her girls were dependent on his parents, Jessie and Missouri Daniel, and Clyde always expressed appreciation for the help received from them. She got her teaching certificate and the family kept the girls while she taught school the next year. Clyde married James Finley William in October 1909 and the family lived in and around Mooringsport, LA for the next few years. He was the only father Willie could remember. Winnie and Willie were identical twins and liked to pretend to be each other to fool their mother. Winnie had respiratory problems and knew she had been told not to go outdoors in the cold. However she realized one morning that her doll was outside in the yard. She said, “I will be Willie and get my doll.” She got chilled from the dew, became ill, and died on October 5, 1910. Willie graduated from Mooringsport High School and then got her teaching certificate from Arkansas State Teachers College in Conway, Arkansas. She was head of the primary department of the Lou Ann Public Schools for three years, and the principal gave her a glowing letter of recommendation when she resigned. 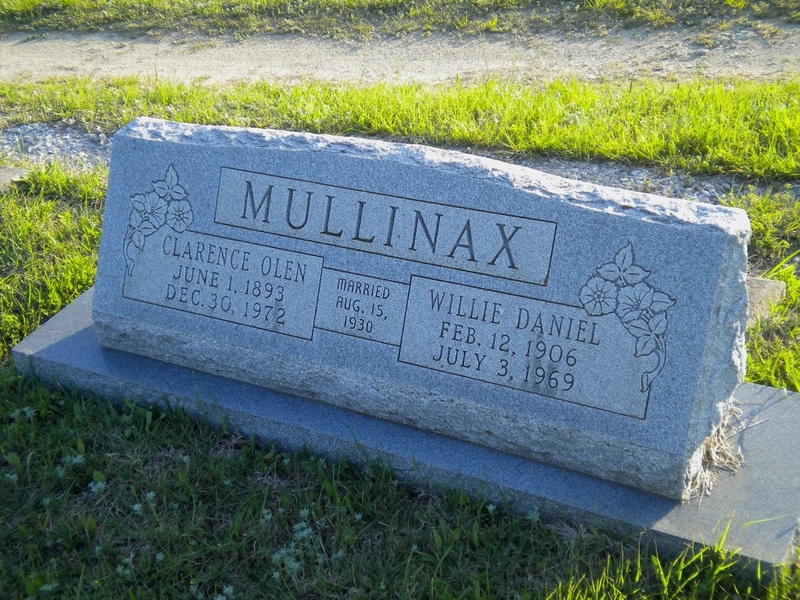 Clarence O. Mullinax and Willie Daniel were married in LaFayette Co., Arkansas on 15 August 1930 and moved to Texas a short time later. Their two children, George and Una Clyde, remember living in Weatherford in 1943 while Clarence worked in a defense plant during WWII. In 1945, the family moved to Kermit. Willie taught first grade in Kermit for many years. 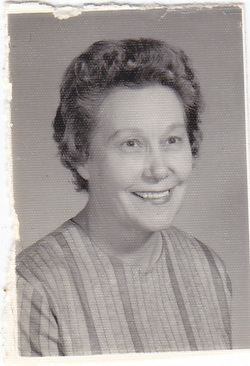 She returned to college and got her degree in 1953 from Sul Ross University in Alpine by going weekends and summers. One of the funniest things happened in her classroom because the room was too full. One boy was seated so he could not see the board. He learned to print his letters upside down by looking at the paper across from him. This was not discovered until the end of April. The decision was to pass him on to the second grade. Willie was 5’6” tall and loved pretty clothes. One year she went to get her driver’s license renewed, and mistakenly reversed the numbers on her height. When the clerk tried to correct her, she said in her best school-teaching manner, “I guess I know how tall I am!” Then she enjoyed showing her driver’s license for the next two years that said she was 6’5” tall. Willie died on 3 July 1969 in Kermit, TX, of stomach cancer. She was 63 years old. Teachers at her school put a plaque in the foyer of her school. She had been the consummate teacher. She was survived by her mother Clyde William, older sister Una Magee, her husband Clarence, two children, and four grandchildren. In Willie’s family tree, there are six preachers starting with two Anglican ministers in Virginia, Rev. Robert Bracewell of St. Luke’s Chapel in Isle of Wight County and Rev. Rowland Jones of Bruton Parish in Williamsburg. Then there is Rev. Giles Chapman, who started out as a Quaker, and his father-in-law, Rev. John Summers, both of whom became Universalists in Newberry, South Carolina. Rev. Edward Skinner was a circuit-riding Methodist preacher in Darlington, South Carolina. Her great-grandfather was Rev. David M. Jordan, a Baptist born in Baker County, Georgia, who moved his family to Texas by 1856, and was instrumental in founding six churches in Hardin County, Texas.